APC KVM Bundles that include everything you need to get connected with switch, video monitor, keyboard, and mouse all included for a simple plug and play solution to efficient server control and monitoring! 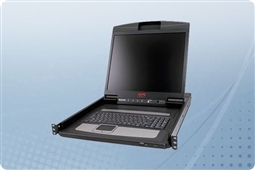 APC LCD Rack Consoles perfect for connecting to your KVM switch with keyboard, video display, and mouse all build into a simple 1U design for saving space and reducing hardware cost! Aventis Systems is proud to offer all of our APC KVM consoles and switches with a 1 Year Standard Essentials Warranty with upgrades available to Express NBD parts replacement or Extended term Warranties. So shop our APC KVM options below and bring in efficient and reliable datacenter and server room management to your business today!